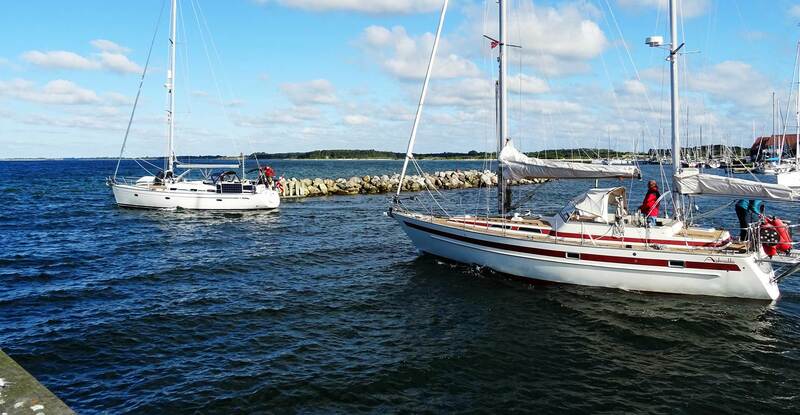 It was one of these harbors you will probably never forget in your sailing life, no matter which ports your yacht will land in the future to come. 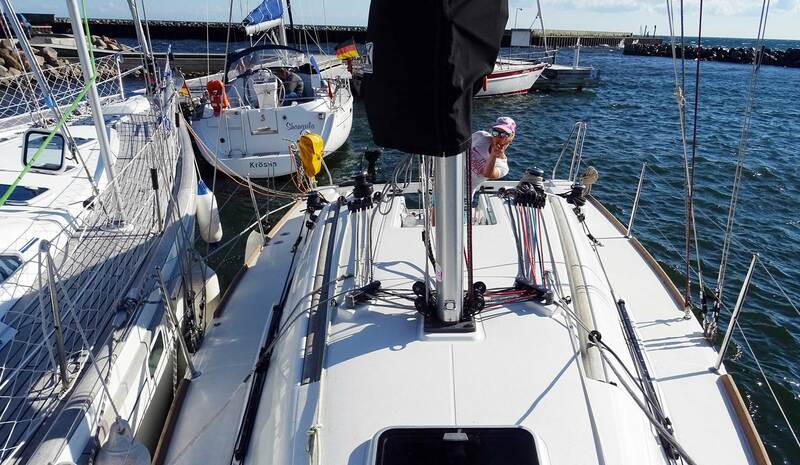 After some 100 miles of sailing on our Beneteau First 30 we´ve reached Klintholm marina fairly late and we were lucky of having arrived before a strong wind set in and some 15 yachts stormed the harbor to desperately fight for the last free berths and rafting places. Welcome to Klintholm Marina: What a nice place for sailing crews! You may read about the first stage of this sailing trip here. 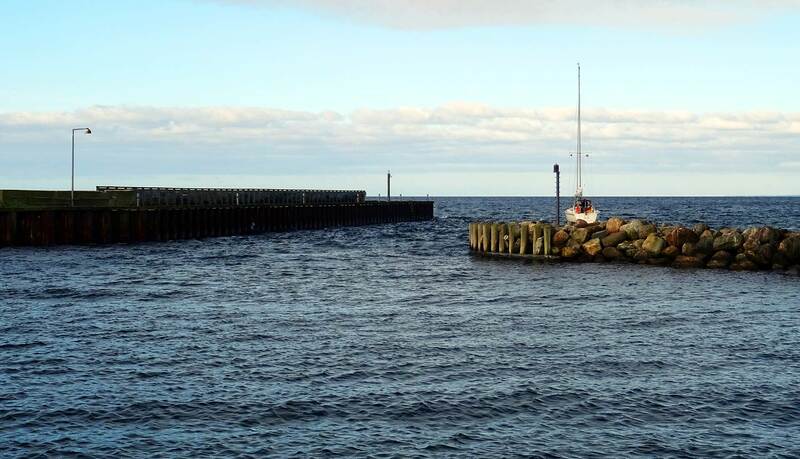 We´ve decided to stay just one night and leave the next day as we were on our way to the Danish island of Bornholm. 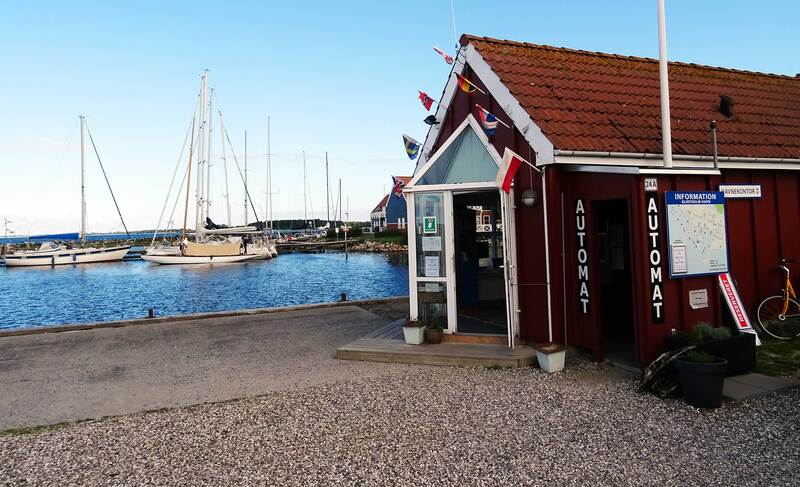 Nevertheless, I found Klintholm Marina worth a mention in this Marina Review section because this is a particularly picturesque, kempt and nice place that may as well elate you on your own sailing cruise through the Baltic Sea. 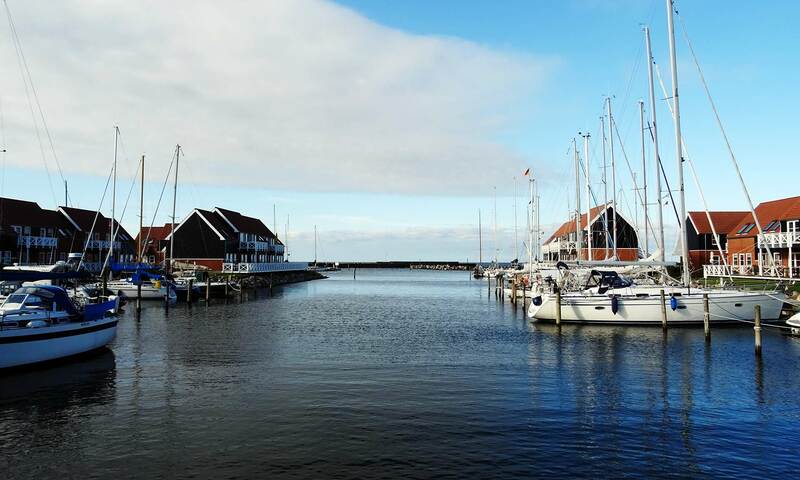 Klintholm is situated on the Danish Island of Moen at the easternmost tip – vis-à-vis the notorious cliff line called “Moen´s Klint” which you should definitely visit when staying here longer. The harbor is placed on the eastern shore of Moen which poses it directly to the predominant westerly winds which can be blowing pretty hard here. There is sufficient protection against swell by large moles, but as we had experienced by ourselves, the strong gusts will cause a pretty high-pitched halyard-clanking concert. 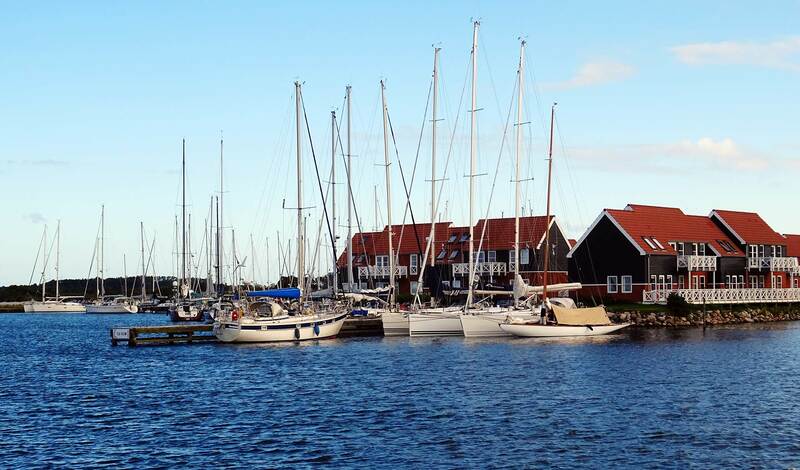 As with every smaller Danish marina it is advised to arrive early here for getting a free berth and avoiding rafting next to another sailing yacht. We couldn´t manage to do so and upon entering harbor at 4 o´clock all berths had been already occupied and we were lucky to find a large Beneteau 47 Clipper to go alongside: Just 30 minutes later there was a huge ballet of no less than 10 yachts desperately going round in circles in search for a similar opportunity. Rafting may be the only way to stay here. When there are strong Westerlies blowing, there´s big swell in the harbor entrance and a skipper should pluck up courage to enter with high speed, go around the mole hard port side to kill the speed. We´ve seen some yachts literally surfing on top of waves into the harbor – coming dangerously near the stony moles. This harbor is a dream site for sure! It consists of multiple basins offering some 200 berths for yachts with a maximum draft of up to 3 metres. The northernmost basin is most exposed to westerly winds and the farthest from the facilities – but therefore nearest to the empty shoreline and the rich natural resources of this area. Then there´s a basin which I liked particularly because the jetties are surrounded by holiday homes. This can be pretty picturesque but one should like the prospect of mooring under the eyes of tourists. Another basin is in front of the harbor master´s office (where we found a rafting berth next to another Beneteau) and here is where it´s most quiet and you´ll probably have the shortest ways to both office, facilities and the small village of Klintholm with the supermarket and restaurants and stuff. Upon arrival – if there´s time to do so – you may go around in circles with your yacht to see which basin´s atmosphere you like most. This is what I found the most noteworthy thing about Klintholm marina: It´s versatility in terms of different “sceneries” offered here. You may either find a quiet far-flung place for you to stay or a berth in the midst of the lively holiday atmosphere: It´s your choice. Prices have been very, very high here when we arrived. This was kind of irritating to us as we had never paid such high demurrage for a boat that small: Our Beneteau First 30 is some 30 feet (9.15 metres) in length and we had to pay 25 Euros for one night here. This is exceptionally expensive even for Danish conditions. I can only imagine this high-priced policy for their monopoly in this region of the Baltic Sea. This, honestly, was a kind of shocking moment. Nevertheless, it´s holiday and I think the very nice surrounding and the high-class of the marina itself may be worth this price. What I particularly liked is the possibility of pre-booking a berth here: You may browse to this website and enter your boat´s measurements and date of arrival to find a guaranteed free berth. This is particularly advisable during high season as all nicer Danish marinas are constantly flooded by sailing crews. 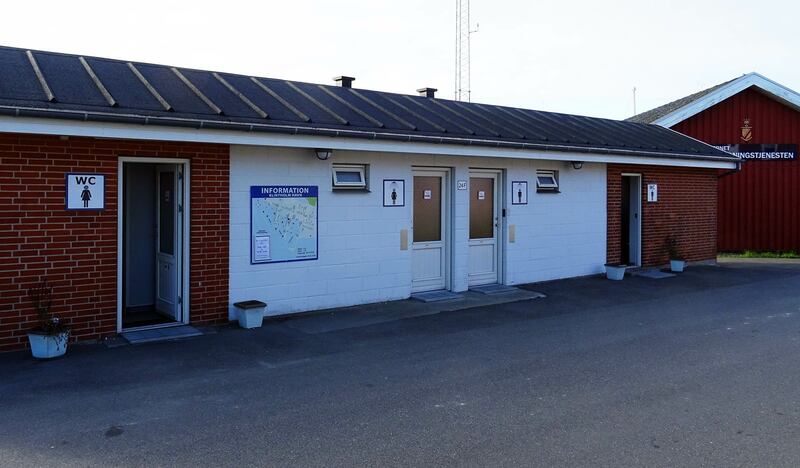 As with nearly every Danish marina I´ve seen so far the facilities are well kept and will be cleaned at least two times a day during the week. Taking a shower isn´t included in your demurrage and you´ll need to have some coins. This is something I do not like about Denmark although it may save water for sure: In German marinas taking a shower isn´t normally restricted to a certain amount of money (or time). Although, it might be clever to adjust your showering and toilet-usage to the general timetable of the other sailors: As you may know, from 7 to 9 a.m. and around 17.00 to 19.00 in the evening the facilities are run over by all the crews storming the bathrooms to either get ready for casting off or to get down after a day out sailing. I love to have my cleansing sessions very early or in the middle of the night though. Klintholm village is a very small community. There is nothing like a waterfront here although the village center offers a handful of shops. There´s a small supermarket where you will find most of products for stocking up your provisions, shops with locally made products and souvenirs and a seldom open shop that offers fish that has been harvested by the local fishermen. It´s a quiet place, no party around here. 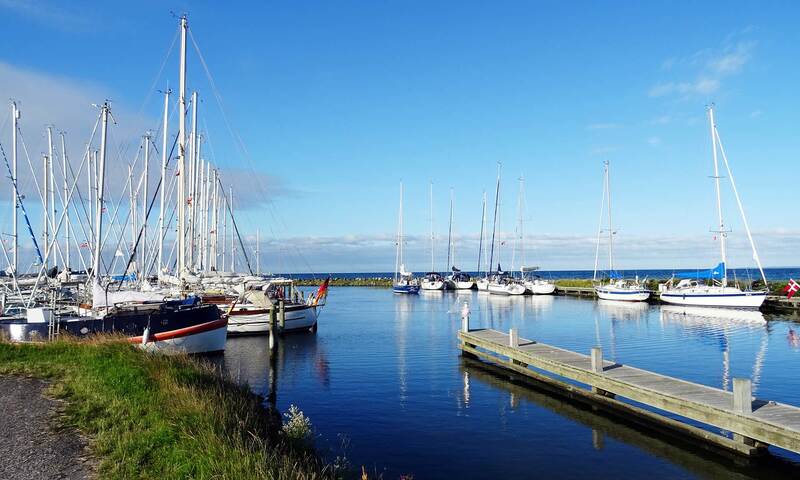 Crews seeking the beauty of nature will find a perfect mooring here: Rent a bike and have extensive tours on the Island of Moen – don´t forget to pay a visit to Moen´s Klint! – or going our with a real Fisherman to swing a fishing rod. Klintholm marina is for calming down and resting. To make it short: I loved being here. It was the perfect place for us after some 14 hours of constantly sailing and for calming down and resting. It´s a picturesque place without any bothersome side effects. It´s clean and tidy, people are friendly, no hustle here (except for the daily late run for free berths, which also is quite an amusing theatrical ballet to observe). The only thing that is noteworthy in a negative way is the high price for demurrage.